Hi, I’m late to the party but here’s a book! 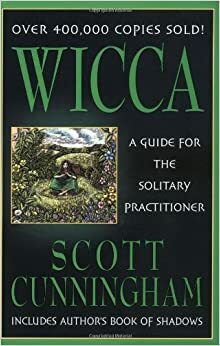 Wicca: A Guide for the Solitary Practitioner is great if you want to go down the Wicca path AND it’s made specifically for solitary practitioners along with having some of Scott Cunninghams own spells in it as well. Scott Cunnigham is one of the most prolific and influential Wiccans, and he’s an easy to digest writer compared to some other authors (at least for me). I’d recommend you start with reading. Buckland's Complete Book of Witchcraft and Buckland's Book of Spirit Communications are good books for getting a decent understanding of what could be (subjectively speaking) considered “traditional” witchcraft. I myself am NOT a fan of the Llewellyn branch of magick, as it is heavily based around forming structured groups and covens and much of the information seems more ceremonial than anything. That being said, these books give a great basic rundown into alot of different styles and tools you will most likely be using or want to use. Cunningham's Encyclopedia of Magical Herbs is a good rundown of many common and uncommon reagents used in witchcraft along with their metaphysical uses. Reader's Digest Magic and Medicine of Plants despite the name is a more practical and scientifically written book on the historical and medicinal used of many N. American plants. Inside the Mirror Box: Spells and Theory for All Practitioners was actually written by a friend of mine. His book gives alot of information on actual spellwork, along with a large selection of Mirror Box spells and a short section on other uses for mirrors (such as divination). And finally the Encyclopedia of Spirits is a great reference guide for those of us who want to work with specific entities. The author covers the full gamut of spirits and deities from the ancient gods to christian saints and archangels to lesser known spirits. Also go talk to your mom, she what she knows and can teach. A real life teacher is better than any book imo.